pictures are good, but not much in the way of the park in that book if I recall. Quote from: "BEN AND GENA"
Thanks for this mention, hadn't heard of this one. There are some cool photos of the airfield in Smithers' book, "Chronicles of the Big Bend". Smithers had an underground darkroom at Johnson's Ranch. I have read close to 20 of these books. I don't think I have read one yet that I didn't like. The one exception is the "Tales of the Big Bend" series. Too much lore and legend and not enough history. I like the true history stuff. The Big Bend Pictures book is a good coffee table book. The pictures are great but a lot of them are not "Big Bend". My favorite "coffee table book" is Texas Mountains. It has photos and a little history of all of the mountains in West Texas. My favorite "coffee table book" is Texas Mountains. It has photos and a little history of all of the mountains in West Texas. Whenever someone tells me "there aren't any mountains in Texas"....that book comes in quite handy. Those are the same people who think San Antonio is West Texas. I am still annoyed by people saying they are from West Texas when they say they are from Amarillo...but I guess technically, it's true. 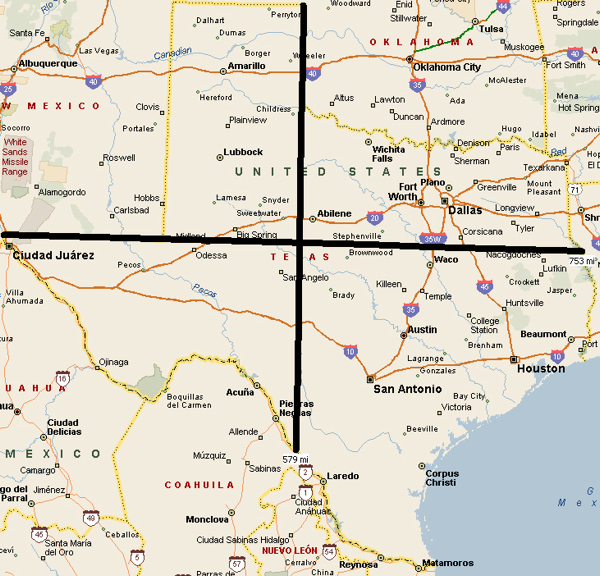 Following the logic that Amarillo was in West Texas, I guess Laredo is in East Texas. Never, even gave it a thought :! : :! : ...You always learn something on this board. I should note that I drew the lines on that map. I drew the horizontal line in the widest part of the state, then drew a vertical line through the center point of the horizontal line. These are mainly human histories - both are out of print but show up on Ebay from time to time. I'm re-reading John Jameson's book (#33). I thought it was interesting that the ceremony to cede control of park lands to the Federal Gumint was scheduled for June 6, 1944. Turns out there was something BIG going on that day, so the ceremony was pushed back to June 12th. President Franklin Roosevelt received the deed to the property of the Big Bend on D-Day (June 6, 1944). The park was formally established six days later, and officially opened to visitors in July 1944. Wow. I had never heard that. Thanks for sharing that. Not really being able to respond as I would have liked to that comment, I decided to check out her book. It is a children's book called Dragonfly Pin by Jacqueline Stem. It is about a third grade reading level and is a mystery. Those of you with elementary age kids might enjoy having them read it. It is mildly entertaining. Other than the facts that the Boquillas Canyon trail starts at Rio Grande Village, Mariscal Mine is a good place for secret agents to meet to exchange information, and families with young children go running up and down the trail from the basin to their remote campsite several times a day it was fine. Seriously, the premise is weak, but it isn't too bad. There seem to be only a small number of books for elementary age children about Big Bend so if you have kids you can check it out. Well, let's hope her views and attitudes don't corrupt young minds. She sounds like the perfect voter many politicians would like to see: uninformed and afraid, not to mention apparently at least a little biased culturally.